No one is very fond of chinese cuisines at home except for my younger sister. But Schezwan fried rice and Veg chinese fried rice is fondly eaten by all at home. I learnt Schezwan fried rice from one of my cousin and regularly cook it on Sundays. There is not much effort needed for cooking it. Colour and smell just tempts you to grab a spoonful of rice as soon as it is cooked. I started with soaking of kashmiri chillies in water. Remove the seeds from the chillies as it is not good for health to swallow those spicy seeds. This might burn your hand a little but be careful not to touch inside of chilli and then it will be easily done. 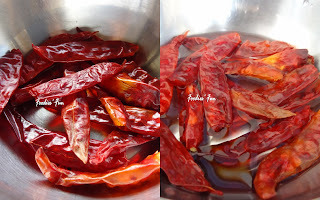 Soak kashmiri chilli in water 1 hour before making the schezwan sauce. Cut carrots and french beans into an inch long piece. Peel off peas. Wash them all properly. Wash and boil rice in water adding salt and little oil/ghee to add nice shine to you rice. Also put carrot, french beans and peas along with rice. Boiling will take about 10 minutes. Slice off capsicum and cabbage into thin horizontal slices. Cut the green of spring onions into rounds trimming off the rugged ends at the top. Also finely chop green garlic. 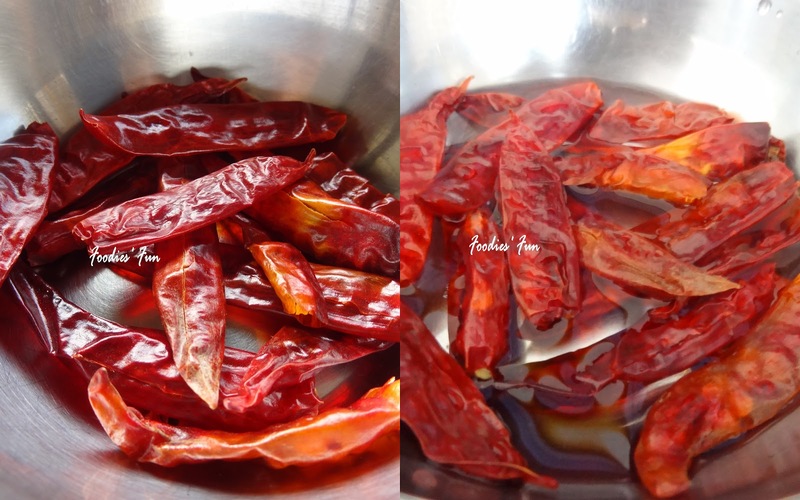 Almost after an hour or so drain off the water from soaked kashmiri chillies and grind them in a mixture grinder. Also grind ginger if not available. Next was making of schezwan sauce. Take a big kadai. Put oil in it and heat it. Put more amount of oil than your regular tempering. As it heats up, put generous amount of finely chopped garlic. I used green garlic pods or lilu lasan. It will give a nice fresh taste to your schezwan sauce. Put ginger paste and sauté till garlic turns golden brown. This will take about a minute. Now add spring onions, capsicum, cabbage and grinded kashmiri chilli. Mix them all well. Cook the covered for about 5 minutes. Next put tomato ketchup, salt, pepper, soya sauce and corn flour water. For corn flour, in a cup put 1 tablespoon of corn flour and 1 cup of water. Stir it well so as to avoid lumps. Mix them all well and cook for about 5 minutes till you get spicy peppery smell. Adjust salt and spice as per your taste. Finally add bold rice and vegetables to it. Season generously so that rice gets coated with sauce properly. Take it off the stove and serve it.